In stock -This product will ship today if ordered within the next 10 hours and 50 minutes. Natures Own Wholefood Organic Vitamin C provides 200mg per vegicap of natural vitamin C, which is derived from organic amla fruit. Vitamin C can contribute to a normal function of the immune system and has also shown to have anti-inflammatory properties. The amla fruit contains a high amount of vitamin C, along with more than 50 co-nutrients such as polyphenols and bioflavonoids. Organic Amla Extract providing vitamin C, hydroxypropylmethylcellulose (capsule shell - approved non-organic ingredient). Take 1-2 capsules daily as a food supplement or as directed by a practitioner. Do not use if sealing strip is missing or broken. 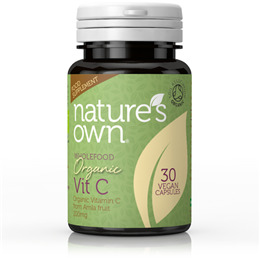 Below are reviews of Natures Own Wholefood Organic Vitamin C - 30 Vegicaps by bodykind customers. If you have tried this product we'd love to hear what you think so please leave a review.